Premier Polishing Corp specializes in polished concrete. We believe it’s superior to all other flooring types. However, we understand people have different tastes and are looking at other flooring options for a particular feel or appearance. 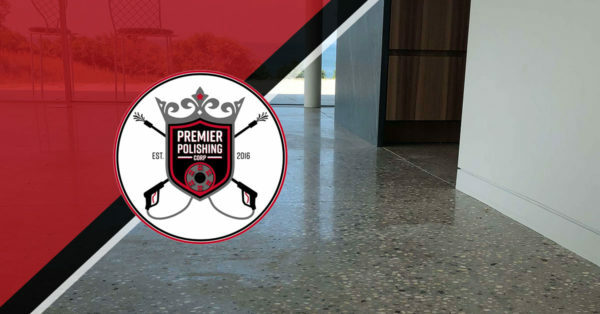 Here, we’ll lay out the reasons why we believe you should choose polished concrete for your flooring needs, whether for your personal residence or for your commercial business. Concrete is known for its strength, as if you’ve ever been to Italy and seen the ancient Roman bridges, aqueducts, and structures that are still standing (and some are still in use), can attest to. The polishing process varies, with different methods for different purposes employed. 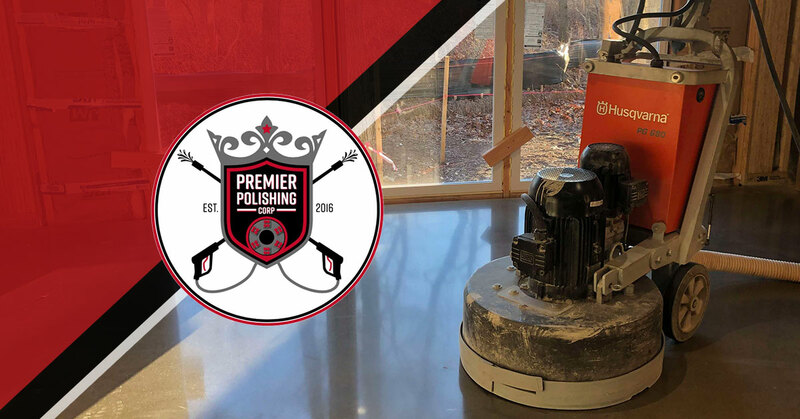 There is the traditional grind and seal process, or one that commercial businesses prefer due to the constant use, which uses a sealer that creates a reflective surface followed by a chemical hardener and another round of grinding. WHAT’S THE MAIN BENEFIT OF POLISHED CONCRETE? Polished concrete is known for many benefits, but it’s primarily known for its durability and its ease of maintenance. Its smooth hard surface, especially with a sealer on it, makes it easy to clean and hard to damage. In fact, it’s usually Mother Nature that damages concrete in the form of moisture (rain, snow, or hail). CAN YOU CUSTOMIZE POLISHED CONCRETE? Polished concrete is very customizable. Take what it’s made of: sand and gravel. 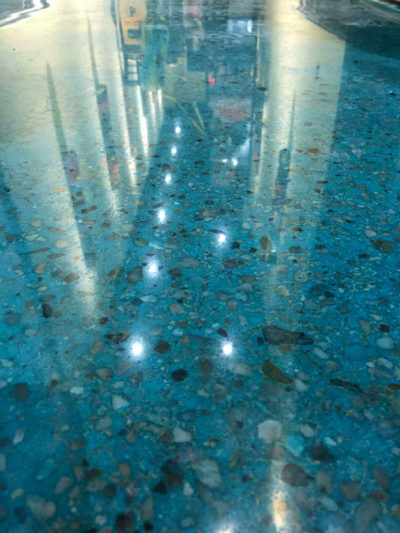 There are different kinds of sand and gravel, some in very cool and creative colors, which allow for the uniquability aspect of your polished concrete floor. In fact, polished concrete is becoming well known for its ability to be customized, allowing for a variety of applications and looks. As polished concrete uses and abilities have grown in the past decade, so have more advanced techniques and materials to meet these higher expectations. Polished concrete can also be colored to almost any color, either before, during, or after the placement process. Usually, either iron oxide pigment is used when the concrete is being mixed, or dry-shake color hardeners that are applied to the surface of the concrete and worked into it. These two methods are employed during the manufacturing process. After concrete has hardened, dyes are employed, which penetrate the surface in a process reserved for outdoor surfaces only. Stains and waterproof paint are also used to color polished concrete after the manufacturing process. There are different levels of polished concrete floor finishes as well, depending on the diamond grit you use. Furthermore, different ranges of aggregate exposure and different levels of sheen, from matte to a glassy mirror-like finish are achievable. Polished concrete can be finished to mimic different materials, such as stone and ceramic tiles, which give you the look you are after with the benefits of the long-lasting, low-maintenance flooring. WHAT IS THE MAINTENANCE REQUIREMENTS OF POLISHED CONCRETE? Polished concrete, being an all natural building material, only requires detergent-free water on a regular basis to maintain. If your polished concrete is sealed polished concrete, a bit more maintenance may be required, such as reapplication of the sealer in the future. Any spots in your polished concrete that become damaged are usually easily fixed by having that one area be ground, repolished, and treated. Yes! Polished concrete is 100 percent recyclable due to the all natural ingredients it is made from. In ancient history in fact it was commonplace for concrete structures to be torn down and reused to build walls for example and other buildings. The ancient Greeks lost many beautiful temples and homes to such appropriation as have Hadrian’s Wall in England. Environmentally sustainable, polished concrete is increasingly popular both in commercial use and residential use as humans become more earth-conscious. WHY IS POLISHED CONCRETE SUPERIOR IN FLOORING OPTIONS? Premier Polishing Corp believes in the superiority of polished concrete to all other floors. Besides the above listed reasons of durability and low maintenance requirements, polished concrete floors are waterproof and have a low slippage rating. They are stain resistant and environmentally friendly. It’s the most economical in terms of maintenance costs, and in terms of heavy usage, will hold up the best. 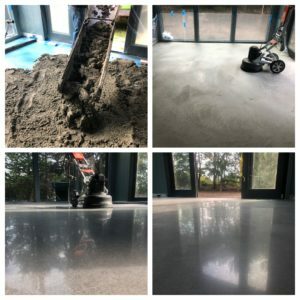 Whether you own a commercial business with a lot of foot-traffic, an industrial warehouse where forklifts are being driven over your floors constantly, or you breed Great Danes and frequently have a dozen or more of these huge, lovable dogs running around on your floors and have accidents during potty-training, polished concrete floors are the best flooring solution for you today. 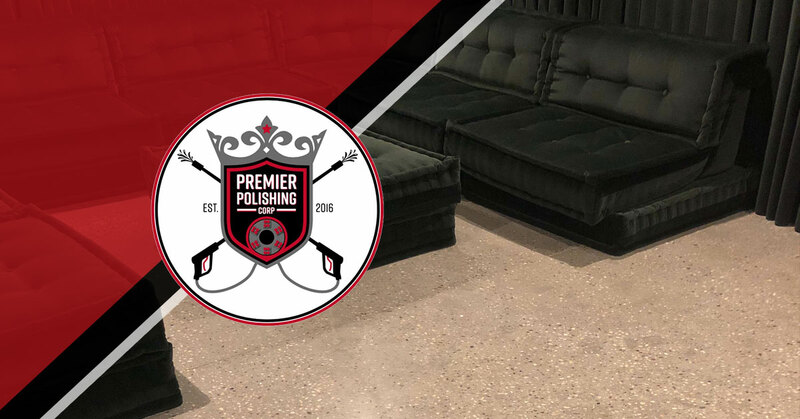 Contact Premier Polishing Corp today to get a free estimate!